Born in Taipei in 1970, Vincent Shen became a multimillionaire in his late twenties when he was at Merrill Lynch as Managing Director leading the Private Investment Banking Group covering the Greater China market. After his early retirement, he achieved more success by funding CHC Healthcare Group in 2009, one of the biggest oncology centres in Asia, which had its IPO in 2012 with a one billion-dollar market cap. 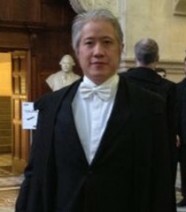 Since then, Vincent earned his EMBA degree from Saïd Business School, University of Oxford. He has now dedicated his work life to impact investment by sponsoring social entrepreneurs with innovative technologies. Among other roles played by Vincent, he is Chairman of JSY Innovation Matrix Ltd.